Brief updates on the storms today are going to be posted below. 6:49 PM: The last of the heavy thunderstorms have moved out of the area, and are now off the coast of Long Island. Tonight’s update will be posted in the next hour, with tomorrow’s forecast and the latest update for the rain storm early next week. 6:12 PM: A heavy thunderstorm is currently affecting Sag Harbor in eastern Long Island and is moving southeast. This storm is capable of producing heavy rainfall, strong wind gusts and potentially small hail. 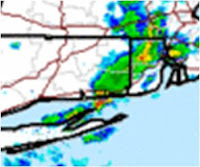 The storm cell that was over southeastern Connecticut is headed towards the eastern tip of Long Island, where it may produce a period of heavy rain. This storm cell is also capable of producing hail. 5:35 PM: A heavy thunderstorm is now affecting southeastern Connecticut, west of New London. This storm is capable of producing heavy rainfall, strong wind gusts and small hail as it moves southeast. It is expected to move offshore in the next 1/2 hour. 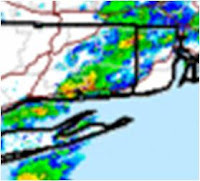 4:23 PM: The thunderstorms have began weakening over northern New Jersey, though heavy thunderstorms are developing in central Connecticut and are moving southeast, they should approach south-central and southeastern Connecticut within the next 1-2 hours. 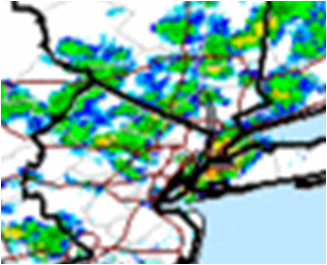 The heavy thunderstorm that moved through NYC earlier is now over south central Long Island, and is expected to move offshore in the next 1/2 hour, tracking southeast. 3:27 PM: Using the same radar image from below, light to moderate showers and thunderstorms are approaching northeastern New Jersey and southeastern New York. Locally heavy rain is possible in the heavier rain showers. 3:24 PM: A heavy thunderstorm has just moved through New York City and northeastern New Jersey, and is now over western Long Island. This storm is moving southeast, and is dropping moderate to heavy rainfall. This storm has produced rainfall amounts up to 1/4 inch, and is expected to produce lighter rainfall amounts, up to 0.1 inch, in western Long Island.